This Kootenai River fishing report is brought to you by Linehan Outfitting Company and provides current Kootenai River and fishing conditions. It will be updated frequently or as conditions change. We have guides available and we’re the local source for all things surrounding the Kootenai River. Give a call anytime if you have any questions about the Kootenai River or anything about Montana fly fishing or fly fishing in general. Hallelujah! Finally daytime temperatures are more normal and the oppressive heat is gone. We’re even getting high cirrus cloud cover some days and conditions here on the Kootenai could not be better at the moment.It’s not smoky up here but we are getting a bit of haze from fires to north and south of us. Presently we don’t have any local forest fires and we’re clicking along day to day here at Linehan Outfitting Company. The haze has created faux cloud cover making for much better fishing conditions and breaking up bright sunshine. Dry fly action has been pretty steady the last few days. Pmd spinner falls are still sputtering along in various places up and down the river around 10:00 am. If you happen to be in the right place at the right time, get out the 6x and give them a good drift. Some days they’re happy to eat a purple haze. Other days they’re snooty and you better have a down wing, low riding pattern. The good news is that they’re on top, you can see them, and target rich environments should continue for a few more mornings. If you get lucky and happen to be in riffle, the success will be better. In glassy, mirrored water like up near the Libby Dam, you better have your best game on because with high sunshine the fish will be a bit more spooky. Caddis activity is definitely starting to slow down. They are still around and still bouncing in certain riffles and runs up and down the river but for the most part the caddis action has been late in the evening, right before last light, and mostly about a happy hour scenario. Goddards, x-caddis, and Bloom’s caddis are all good patterns that will still move fish. Hoppers and droppers and terrestrial patterns are totally in play now. Over the last week big bugs have been the ticket. Foam will work, but in glassy, slick water keep in mind natural materials are often better here on the Kootenai River. Think Schroeder’s parachute hopper, bugmeisters, even stimulators and fish them with at least a 10 foot leader. 5x will help. But often times big bugs will spin 5x tippets so you’ll have to play that as it comes. Some days it seems bread and butter Kootenai River rainbows are looking up all day and eager for a big meal. Other days not so much. And interestingly enough, droppers aren’t really moving that many fish. Most of the LOC guides are running two dry flies for that matter and small hoppers or chubbies with a caddis pattern or emerger are moving fish. 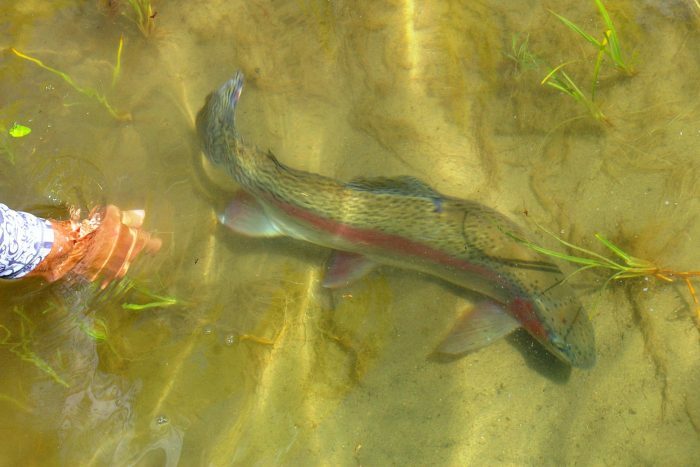 There are gobs of 10″ rainbows in the system this year which has made for great dry fly action regardless. If it’s calm, 4 weights have been best tool for the job on most days this season for dry fly fishing. If you’re looking to move consistently bigger fish in the 12″-14″ range or maybe better, stick with a big bug, roll longer, and cover water. Nymphing has been solid throughout the day. We’ve found ourselves fishing dry flies in the morning and then scratching away during the afternoon with nymphs. Don’t expect trout the be in riffles during heat of afternoon under sunshine and hot temperatures. Look for fish in deep, blue water and in depths of 5-10 feet. Two BB split shot will help and be aggressive on moving indicator up and down depending on depth. Trout are moving a great deal this time of year and under these conditions. Specifically they’ll head for faster water to feed and then fall way back into blue water to the pools and tailouts to hold. Get bugs down, fish every inch of the river, enjoy catching whitefish, and you will find some thicker rainbows too. Bright, sunny days aren’t necessarily the best streamer weather but if you’re inclined, think 250 grain sinking heads and big, really big white streamers. We have had some success early and late which is best bet for pulling junk anyway. Expect daytime temps to remain in the low 80s and there is a chance of t-storms and or showers on middle of the week. Bring it on! possible thunder storms as well. Mornings are refreshingly cool and shadows are sliding across the river earlier in the evenings.